Horses shown how to negotiate an obstacle course to reach a food reward were no better at tackling the simple maze than those who received no human demonstration, a study has shown. The experiment involving 16 horses was carried out in an indoor riding arena in Switzerland that was familiar to all the animals. The ability of horses to adapt to new environments and to acquire new information plays an important role in handling and training. In the context of horse handling, social learning from humans has been rarely investigated but could potentially help in their management. Given that horses interact often with humans, in both training and general horse-keeping, potential information transfer from handlers to horses might thus help to improve their welfare. However, research on social learning in horses to date has delivered contradictory results. 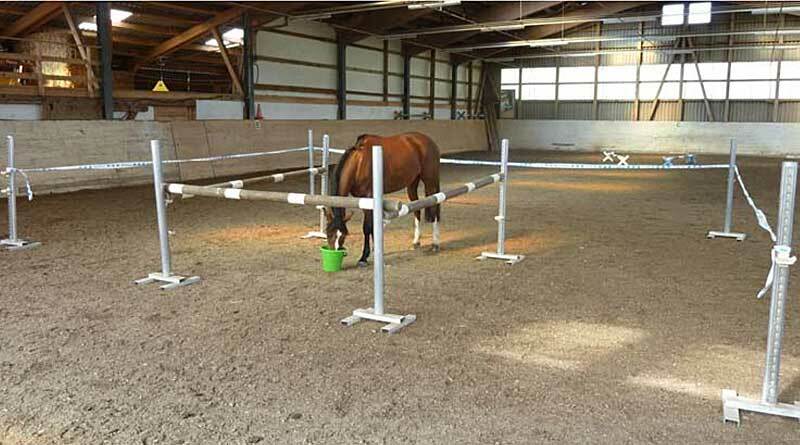 For their study, Joan-Bryce Burla, Janina Siegwart and Christian Nawroth set up a simple maze-like obstacle course, comprising jump stands, wooden rails, and barrier tapes, at the centre of which was a bucket with a handful of feed. The configuration is shown in the illustration below. In each attempt, the horses had three minutes to reach the food reward, otherwise their bid would be considered unsuccessful. The trio, writing in the open-access journal Animals, found that the eight horses who were allowed to observe a human showing how to solve the task did not solve it more often or faster than the eight horses in the control group who received no demonstration. However, both groups of horses negotiated the obstacle faster as they repeated the task. “Together with previous research, our results illustrate that horses do not seem to rely on social information when solving a spatial problem-solving task,” they reported. “Our results indicate that horses do not prefer the use of social information provided by humans when being confronted with a spatial task. They said the use of social information in horses seemed to be context-specific, limited to instrumental tasks – that is, tasks that serve as a means of pursuing an aim. Discussing their findings, the researchers acknowledged that horses are very sensitive in interpreting human communicative and attention cues. “In the current study, however, observing a human demonstrating how to detour an obstacle did not affect the horses’ detour performance. They said rapid individual improvement in detour tasks has been previously shown for horses, indicating that only a few trials are necessary for horses to learn a new spatial task. “Thus, our negative findings for both treatment groups might appear because the horses were simply not able to solve the detour any faster, which masked a potential treatment effect between test groups. “This rapid improvement needs to be taken into account for handling practices, but also for designing future experimental studies. Joan-Bryce Burla, Janina Siegwart and Christian Nawroth.